Dancing Bear Parkside consisted of the demolition of the existing building and “top down” excavation for a 32′ substructure. 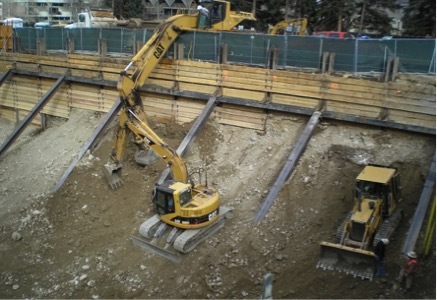 Gould construction worked together with Schnabel Foundation Company to excavate & export the soil at the same time Schnabel installed beams and lagging to create vertically shored walls. The remainder of the work consisted of sub-grade preparation, utility trenching and backfill, backfill of the foundation walls and general site prep.